There is no more iconic guitar than the Fender Stratocaster when it comes to rock n’ roll, but while the guitar suits many players across a wide variety of genres, players of a shred-minded nature—and finesse players in the fusion and prog worlds—often times find the Strat a bit lacking. The classic Stratocaster guitar is glorious in what it does and what it sounds like, but its shortcomings are widely recognized as well, such as tuning instability whenever you so much as look at the tremolo arm, noisy pickups, a blocky neck heel/joint that obstructs high fret access, and on many models, maintenance can be a chore thanks to truss rods that can only be accessed after you remove the neck from the instrument. And while the necks are made for comfort, they’re not necessarily made for speed. 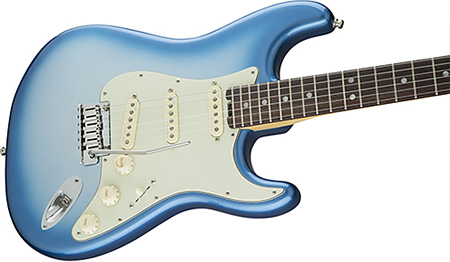 As a result, discerning players are faced with two options: buy a stock Strat and then invest in a wide range of upgrades, like new pickups, a new bridge, locking tuners, strap locks, etc., or turn to the world of boutique guitar builders and other manufacturers for “improved” versions of the timeless instrument. But in this review, we’ve come to praise Caesar, not to bury him. Considering we’re huge fans of boutique instruments—and own more of them than our spouses probably realize, it may come as something of a surprise to many of our readers that we’re gushing over a Fender instrument. But we are smitten with the new Fender American Elite Stratocaster—a modern, refined Stratocaster that is unquestionably one of the finest production models the company has ever built. The Fender American Elite Stratocaster is a worthy option for any serious player who loves the vibe and tone of a genuine Fender Strat but has felt like they needed a “higher performance” instrument to accomplish their musical goals. We’ve been impressed with various Fender artist signature model guitars, but those borrow much from the Fender Custom Shop, are produced in much smaller quantities, and have price tags to match their exclusivity. This guitar, however, elevates Fender craftsmanship to another level. It has a superb build, fit, and finish, with all the upgrades we could ask for, plus others that you can’t actually get as an afterthought. Well done! What looks like a Strat, feels like a Strat, sounds like a Strat, but is more than just… a Strat? That would be the Fender American Elite Stratocaster we got for review, dressed in a beautiful Sky Burst Metallic finish. Right from the start, we could tell that the guitar was a premium model in the Strat family just from the metallic flake-infused finish. Fender American Elite Stratocaster 2016 features a new neck heel! The body is covered in gloss polyurethane, while the neck has a satin urethane finish on the back and gloss on the headstock face. The guitar has an alder body and falls on the lighter side of the Strat scale. The 25.5” scale, maple neck is topped with a rosewood fingerboard on our review guitar, though a maple fretboard is also offered. Two of the most exciting details on this guitar are things you can’t get by way of simply upgrading a lesser Stratocaster model. First is a compound radius neck, which starts at the nut as a C-shape (9.5” radius), and then flattens to a modern D-shaped profile (14” radius) as you play higher up the neck. That improved shredworthiness is further enhanced by killer upgrade number two: an all-new neck heel! The refined design still features four bolts, but is short, curved, and cut away on the treble side to provide greater access to the upper frets on the guitar. The neck has a double-action truss rod with easy access to the adjustment wheel—no need to remove strings nor the neck in order to adjust the neck’s relief. The Strat has twenty-two, medium jumbo, nickel frets and a synthetic bone nut. The hardware on the American Elite Stratocaster is full of the stuff you’d place on an upgrade list. 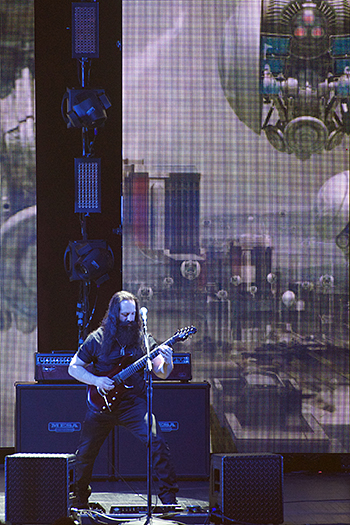 The guitar features a modern, two-point, synchronized tremolo with a copper-infused bridge plate and high-mass saddles, and locking tuners with short posts. There’s only one string tree on the guitar, for the top two strings. 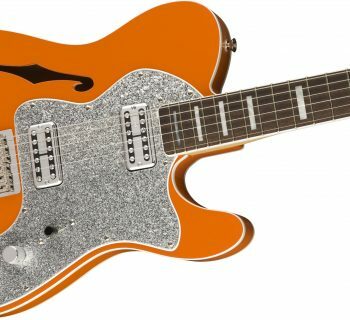 The pickups are Fender’s latest, fourth-generation Noiseless series, single-coil pickups, equipped with the S-1 switching option, mounted to a three-ply pickguard. 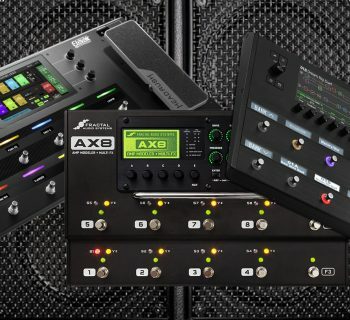 At the push of a button recessed into the top of the Volume knob, an array of additional sounds become available including running all three pickups together and accessing standard pickup combinations in series instead of the typical parallel wiring. Going one step further, while the Tone 1 (neck) knob is standard, the Tone 2 control (bridge and middle) is a No-Load Tone control. When turned to full, the guitar completely bypasses the tone control, removing the 250k potentiometer from the circuit for increased output and clarity. The guitar ships with Fender NPS strings set up in a .009 gauge, in a Fender Elite Molded Case with TSA-approved locks. The Fender American Elite Stratocaster feels just like a Strat… only better! Playing rhythm chords at one end of the neck, we enjoyed that comfy, inviting, Strat feel, thanks to the familiar Fender C-shape neck. But as we moved higher up the neck, it morphed into a modern D-shape, where the subtle flattening inspired more aggressive lead playing. The compound radius design is obvious enough that you can eyeball the change should you choose to carefully study the rear of the neck, but it’s more of a beautiful subtlety when you play the guitar. This gradual flattening of the neck makes the playability fast and easy as you climb up the neck. We didn’t even notice that the neck actually gets a hair thicker behind the D curve (going from .82” at the first fret to .89” at the twelfth fret). The new neck heel further adds to the playability factor, as the cutaway, combined with the flatter neck profile, provided upper fret access that we’ve never enjoyed as much on a genuine Fender Stratocaster. We can’t imagine anyone purposely desiring the old design unless you enjoy the kind of classic ‘80s Strat antics that involved high-gain players banging the back of the neck or pulling on it to tweak pitch. 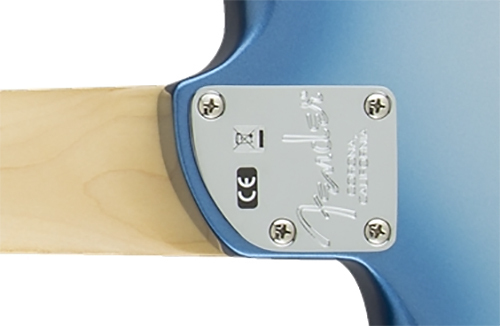 The new neck joint feels engineered to a much tighter tolerance, with obviously less play. Our guitar shipped with a beautiful factory setup and low string height. Between that, the very comfy medium jumbo frets, and the .009s, it’s obvious this Strat has the technical player in its sights. The two-point synchronized tremolo is another beautiful departure from the past. The gentile, floating design allowed for beautiful tremolo playing, no pedal necessary! Tuning stability of the new bridge, coupled with the locking tuners, was excellent. It’s been a few days since we last thought about tuning, actually. Controls functioned as anticipated from a Strat, and the Soft Touch knobs were pretty smooth in operation. Not just the way they scroll, but the rubberized grip is awesome to the touch and far superior to the feel of classic, plastic knobs. Fender American Elite Stratocaster 2016 locking tuners. S-1 Switching From Neck to Bridge (positions 5-1): All three pickups in series, neck and middle in series, middle and bridge in series, neck in parallel with middle and bridge in series, bridge in parallel with neck and middle in series. Whew! The No-Load tone control seemed to snap into place at full like a magnet. As we almost never adjust the tone controls on our Strats, we found another benefit to the design. If you’ve ever played a Strat aggressively and inadvertently hit that lower tone control and messed up your tone, when set to full/10 (which pulls it completely out of the circuit), a casual strike won’t knock it out of place. The Fender American Elite Stratocaster includes strap locks of the familiar Fender and Schaller variety (our personal favorites). Oh wait a sec… no it doesn’t! Looks can be deceiving, and we were disappointed to discover that these Fender Strap Locks are not fully compatible with Schaller strap locks! The top of the pin (the part installed into the guitar) is a few millimeters taller than the Schaller variety. So while our existing Schaller-equipped guitar straps could not attach to this guitar, the new strap buttons provided by Fender worked fine with our other Schaller strap lock-equipped guitars. 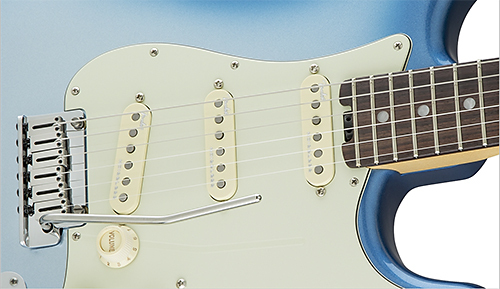 This is a versatile, great sounding Stratocaster! And one of the first and most important things we have to say about the sound of this guitar is that we heard nothing! That’s right—volume up, a fair amount of amp gain, and silence! We’ve owned Strats with earlier generation Fender Noiseless pickups in the past—since their inception, actually, and while they were quiet, their tone didn’t wow us sufficiently. If you’re like us, prepare to be impressed. These fourth generation pickups “stacked” up quite nicely through a 15w Fender Excelsior amp. Plugging the guitar in, with a little bit of the amp’s tremolo dialed into the sound, we obtained some awesome ‘60s surf and ‘50s ballad tones. The first position (bridge pickup) squawked as a good Strat should while retaining a good presence in the sound field. The neck position gave us creamy, pulsating clean tones a la The Platters and Buddy Holly. Moving on with our sound testing, we plugged into a Marshall 100W Jubilee 2555 Head with a 1960BX 100W cab. Dialing in a fair amount of gain and volume, our Strat remained true to form: noiseless. In position 1, we dialed in some excellent SRV-like tones. Position 3 (middle pickup) yielded a similar tone, just a bit backed off at the high end. This was our favorite position in the high gain sound test, and we felt it was the most comfortable sound for lead work. Bringing the No-Load tone control back into the circuit by reducing it from full/10, we experienced a noticeable frequency attenuation. This feature, should we decide to roll back the tone for rhythm parts, could actually serve as a subtle boost for lead work as well when dimed (removing the control from the circuit by maxing it out at 10 results in slightly more signal hitting the pickups). Fender American Elite Stratocaster 2016 bridge and pickups. The neck position yielded tones reminiscent of Hendrix-like fuzz. The guitar remained punchy and articulate, even with a good amount of gain from the amplifier dialed in. We really enjoyed playing the guitar around the twelfth fret with this sound. Lead work had enough growl to it to be extremely musical, yet aggressive at the same time. There is a reason the Fender/Marshall combination is so loved: it works really, really well. Our next sound test involved the Friedman SS100. It’s the closest amp we have on hand to a Plexi, and we really wanted to see how this guitar performed in a more classic setup. Plugged into the SS100s clean channel, our clean tones from positions 2 and 4 were absolutely gorgeous! Glassy yet still present in the mix, they seemed to have a shimmer all their own. This was a great setting to get that Nile Rodgers/Chic disco and funk sound. Strats are well recognized and desired for the 2nd and 4th position, in-between, out-of-phase tones, and the Fender American Elite Stratocaster had that sound by the bucket load. Switching to the dirty channel of the SS, dialing the gain up to about 5, this guitar instrument really nailed a sweet spot between amp and guitar. At this amp setting, it very accurately recreates a fire-breathing Plexi. There was great harmonic complexity in position 1, and once treble and presence were dialed-in appropriately, it was not overly bright. We heard a fantastic representation of the frequency spectrum, surprising coming from a single coil, bridge position pickup. Next, we wanted to check the Elite’s flexibility when it comes to playing progressive rock and modern high gain, so we turned to the ENGL Powerball II and began exploring the traditional tones as well as the crazy options that S-1 switching provides. Wow! As if the five familiar Strat tones weren’t enough, depressing the switch in the Volume knob unleashes a significantly different range of tones. We found that rather than think of these as an alternate set of tones, we found them more useful as options to use in alternating combination with the standard Strat sounds. For example, when playing pickup positions 3-4-5, the S-1 alternate sounds added a subtle volume boost, with an obvious change in the character of the tone, typically getting thicker and sounding a little bit more like a humbucker (all of the S-1 positions run various pickup combinations in series). Playing a rhythm part on the neck pickup or neck/middle combination (positions 4-5), we could easily press the S-1 switch and get a nice complimentary tone, or a lead boost. We were surprised to discover just how much we enjoyed the sound of all three pickups running in series. Don’t underestimate the power of the Tone controls on this guitar, either. 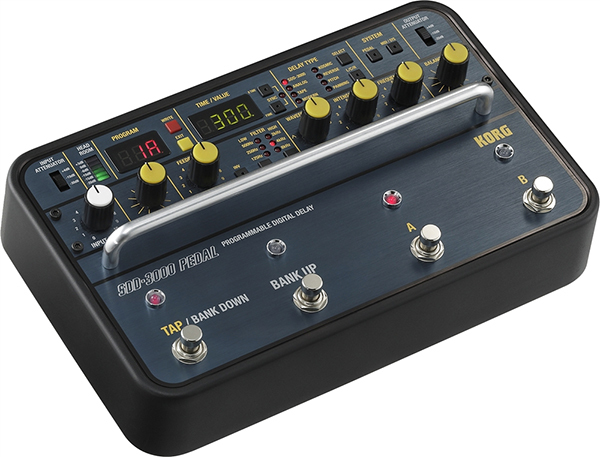 Aside from our earlier experience with the Tone 2 knob and its No Load circuit bypass, we found that the Tone 1 control, when rolled off completely, yielded awesome tones for alt-rock melody lines. This guitar really delivered a stunning array of tones, and while none of the sounds are a replacement for a high-output humbucker in the bridge of a guitar, for everything you want a Strat to be, this guitar has what you need tone-wise. We also directly compared the guitar with our Fender Custom Shop ‘56 reissue, whose tone is beyond reprieve, and it was refreshing to hear that the Fender American Elite Stratocaster came close in both presence and punch. Some of us still preferred the voicing of the Custom Shop’s vintage pickups a little better, but given the noise tradeoff, when a gig calls for high-gain amp use, all of us would reach for the new Elite first. 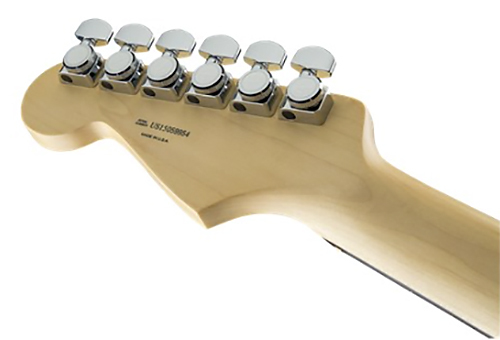 Plus, the Elite’s neck is a nicer match for high-gain shredding. When you look at the overall picture of this guitar, from the sound to the playability, it’s a definite keeper. The Fender American Elite Stratocaster includes a small, generalized Fender manual that covers the basics of guitar maintenance—intonation, truss rod adjustment, string height, etc. as well as a printed sheet that provides the specifics of this guitar’s S-1 pickup controls. Fender has a very comprehensive website with plenty of additional content, videos, support, etc. The Fender American Elite Stratocaster sells for $1,799 in most finishes, with a few selling for $1,899. The price includes the fantastic molded case, a fine leather guitar strap (solid black—not the classic Fender logo strap), and an instrument cable. This is a very good deal for a genuine Stratocaster that performs at a higher level. Fender American Elite Stratocaster 2016 rear view. If you’ve been wishing for a modern Fender that could meet the demands of your prog rock and jazz fusion playing, aspires to a higher quality build than the common build, yet still possesses classic Fender vibe and Stratocaster tone (without the noise), this is the guitar you’ve been waiting for. Us, too.